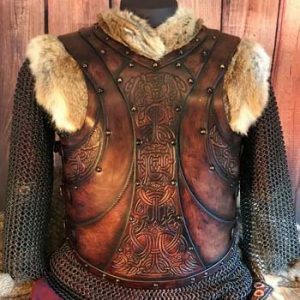 Introducing the NEW Asmund “Skuldro” SCA Leather Armour ,this has been professionally dyed and built for you by ourselves. Created & designed by Alex Agricola, the whole set is made of premium grade top grain Veg Tanned leather ? (laminated to a minimum 6mm thickness)?. Ideal as a base design for personalisation, using the perfect thickness and quality of leather to carve and tool any design. If you purchase this undyed then you will need to dye and seal the surface, otherwise everything has been done for you. This Armour fits a chest size ranging from 40-60 inches (102 ? 152 cm?s). 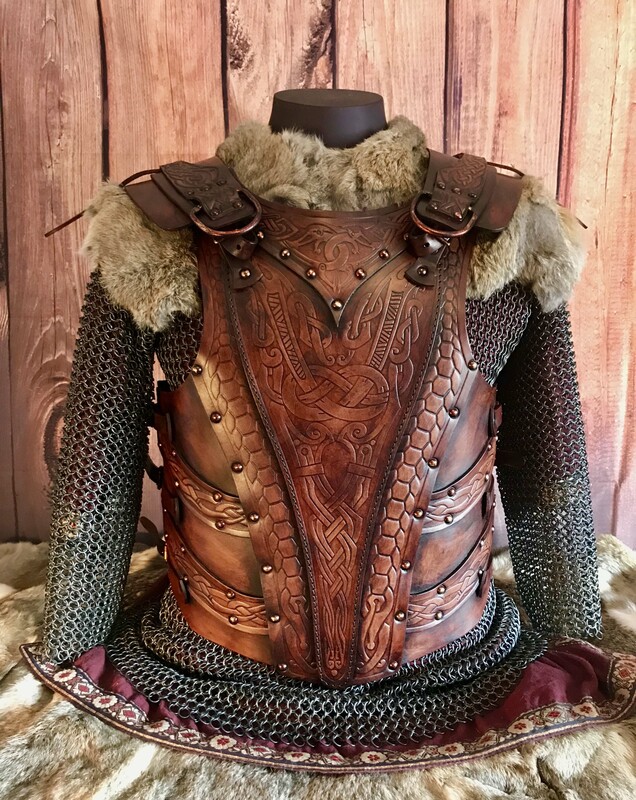 In development for 4 months, this leather armour has proved yet another challenge, bringing a style that will work well for both men an woman (up to a C cup). Both as a practical leather armour, something that looks good as well as a design that works in true combat. Another cross over in styles, I wanted to create something that had a story behind the design and here I was inspired by the Asmund Beserks-Slayer, a Viking hero of the Icelandic legendary saga of Egils. Months later? this is the result, to create something special for you. All hand stained and finished, then embossed with our original designs created for Black Raven by our very own Viking hero Artist Micke Johansson and I hope you?ll agree a marriage of crafts made in Valhalla !! As with all my armours, this example design has been lovingly aged, distressed, antiqued and finished to give that ?real? look and feel and I?ve added some light stamp work to show you the kind of look possible with a little extra time, this can be added to your armour for an extra charge by special request. These items are normally in stock, but require hand finishing and staining for each order, this typically requires 2 to 4 weeks between order date and the shipping date. We can supply Brass or Nickle Plated fittings to the armour. The Asmund “Skuldro” Deluxe SCA Leather Armour is the centrepiece of the Asmund “Skuldro” full Leather SCA Armour set. Black Raven Armoury’s own Alex Agricola had a vision for? 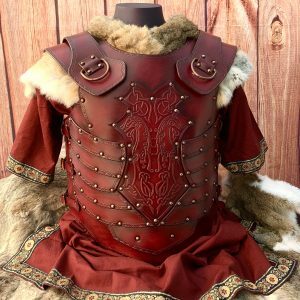 an elegant yet functional leather armour and the Asmund “Skuldro” Deluxe is the result this is the same as our Asmund armour but with an alternative shoulder design.. The Asmund has a Norse look and feel and comes complete with Embossed Designs by Black Raven’s own Viking hero, artist Micke Johansson. Formed and fashioned from the best premium grade top-grain Veg Tanned leather? (laminated to a minimum 6mm thickness). The Asmund”Skuldro” Deluxe SCA Leather Armour is finished in the Black Raven Armoury signature battle worn style. 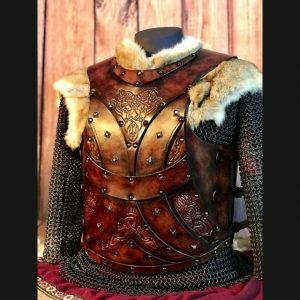 This armour is designed to be worn and used and is suitable for LARPING, re-enactment, SCA, HEMA and detailed enough to be used on screen and will stand up to close scrutiny and the sternest critique. Please be aware that all of the Armours Black Raven produces are hand made and finished to order, so please allow sufficient time ahead of your event when ordering. If you place an order on a Friday afternoon it will not be processed until Monday morning UK time.